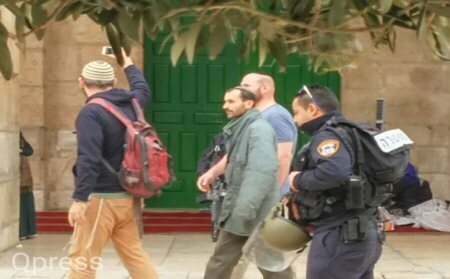 Dozens of extremist settlers and Israeli occupation authorities stormed Al-Aqsa Mosque from the Mughrabi Gate, on Wednesday morning. Israeli police provided full protection to the settlers, who began their entry and tour through various parts of the mosque, until they left. 39 settlers, 67 Jewish students and an intelligence officer, accompanied by five Americans, stormed Al-Aqsa Mosque in several groups and organized provocative tours through its courtyards, while providing explanations about the so-called “Temple”, the Jerusalemite Endowments Department said, according to Al Ray. The department reported that eight elements of the occupation police were dressed in civilian clothes and accompanied by three Israeli officers. During these incursions, attempts were made to perform rituals in the mosque courtyards, specifically near the Gate of Mercy. Israeli police imposed restrictions on the entry of worshipers to the holy site, retaining some of their identities, especially those of women. Despite the restrictions of the occupation, dozens of residents from Jerusalem and across the occupied Palestinian territories had come to pray at Al-Aqsa Mosque since the morning, study the Quran and receive the lessons of knowledge. Settlers and extremist Jewish groups expose Al-Aqsa Mosque, daily (except on Friday and Saturday), to a series of violations and intrusions, in the morning and evening. According to the Islamic Endowments Department, the number of settlers entering the Al-Aqsa Mosque in 2018 was 29,801, an increase of about 17% over 2017.